A workshop on public data was conducted by Sunil Abraham and Sumandro Chattapadhyay for the officials of the Government of Iraq. It was organized by UNDP Iraq in Amman, Jordan from October 18 to 23, 2012. Sumandro Chattapadhyay shares with us the developments from the workshop held over five days. Last year, Sunil Abraham and Sumandro Chattapadhyay were invited by UNDP Iraq to facilitate a series of two workshops for Iraqi government officials on the subject of government data policy and use cases. The workshops were coordinated and co-facilitated by Abeer Fawaeer of UNDP Iraq. The first workshop involved an engaged discussion of international best practices in government data policies, followed by development of a draft public data policy for the Government of Iraq. The second workshop focused on building scenarios of inter-ministerial and inter-departmental data sharing and visualisation. The purpose of the latter workshop was to discuss the data challenges faced by Iraqi government officials in collecting, archiving, sharing and using datasets for governmental activities. Responding to the challenges shared by the participants, the workshop explored various international best practices and FLOSS tools for working with data. Further, the workshop featured daily practical sessions where the participants created paper prototypes of inter-ministerial data sharing work-flows, visualisation strategies for governmental datasets, etc. Below is a summarised report from the second workshop. The first day of the workshop began with a round of introductions of the participants and the experts. The opening session introduced the idea of open data, the open data movement taking place across the world, the multilateral agreements regarding adoption of open data strategies as part of the Open Government Partnership, and the principles and methods of scenario building and paper prototyping. A human resource survey was conducted before the workshop among various Iraqi government officials to collect information on the following questions: (a) what data managed by Iraqi government ministries and departments can potentially be shared with the public, (b) what data cannot be shared with the public, (c) what are the major challenges Iraqi government officials face when working with or sharing governmental data, and (d) how such challenges can be addressed and resolved. This survey was conducted both before the initial workshop (on Iraqi public data policy) and at the initial workshop. Summary of the responses from both these surveys were presented at this workshop (on data scenario building). The participants briefly reflected on the findings of these surveys and pointed out that the actual reality of intra-governmental data collection and management in Iraq is not as bleak as indicated at in the survey responses. However, the participants noted that data sharing between various departments and between the central government and the provincial governorates is a great challenge, especially due to lack of common data collection and management protocols, centralised data storage, and legal and administrative framework governing such data sharing. Building on the discussion, the participants took part in a group-based exercise to identify which datasets will be produced by various departments and ministries as part of the e-services mentioned in the Government Interoperability Framework (GIF) document, and which datasets among them are useful to combine together to gain insights. E-services of three types were considered: government-to-government, government-to-citizen, and government-to-business. The datasets identified in this exercise were used later in the workshop to build use scenarios for. Dr. Rufus Pollock, Co-Founder, Open Knoweldge Foundation joined us at the end of the day to talk about the works of the Foundation, the important of open data in governance, and principles for implementing open data projects. Answering the questions from the participants, he mentioned that open data initiatives should be simultaneously top-down – where the government adopt certain strategies and procedures – and bottom-up – where the citizens are encouraged to participate, respond and use the shared resources. 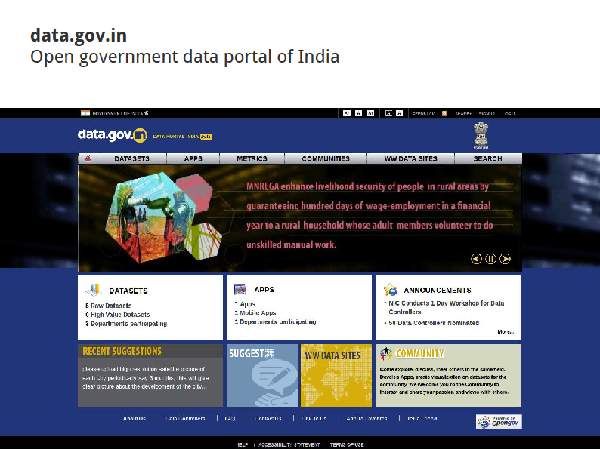 A screen shot of the Government of India website. The picture was taken from a presentation made on Day 2. The second day began with a survey of international examples of open data projects, web-portals, visualisation projects and advocacy organisations. Pioneering open government data portals such as the data.gov portal of USA, data.gov.uk portal of UK, data.gov.bh portal of Bahrain, data.gov.in portal of India, and opendata.go.ke of Kenya were discussed, along with non-governmental open data initiatives such as data.undp.org of UNDP and data.worldbank.org of World Bank. The roles played by various organisations like Open Knowledge Foundation in either creating visualisations using open government data or developing sites that further track governmental activities (such as GovTrack.us and TheyWorkForYou.com) were discussed. Throughout the discussion there was a focus in understanding various technical strategies and softwares used by different open data portal, so that Iraqi officials can make an informed choice when it comes to technical concerns of setting up an open government data portal. The next session focused upon four major softwares for mobile phone based data collection. These included Nokia Data Gathering, OpenDataKit, RapidSMS and FrontlineSMS. Various technical and operational advantages and disadvantages of these softwares were discussed at length. The following exercise built on the discussion of various kinds of datasets and forms required to collect them. In the exercise the participants, divided in groups, focused on various governmental scenarios (such as registration of a company) which involve data collection, management, storage and sharing between multiple ministries and departments. They designed, on paper, forms that can be used to collect all relevant data for each of the scenario, and the sharing of the collected information among various concerned ministries and departments. All the groups presented their forms and data sharing scenarios and each were discussed separately. The third day was about exploring the possibilities of different types and use cases of data visualisations that can be produced and used by different government agencies to inform their decisions, once there is greater sharing of open and standardised data by and within the Iraqi government bodies. The first session briefly introduced the history of visualising beginning from Florence Nightingale's Rose Diagram and went on to clarify and explain the various data visualisation types, their advantages and disadvantages. Different principles and strategies for data visualisation were discussed, along with a range of free and open source softwares and code libraries for producing various kinds of data visualisation. Softwares suitable for creating both offline (static) and web-based (dynamic) visualisation were considered, as well as few open source options for building data archives (such as CKAN and Open Government Platform). 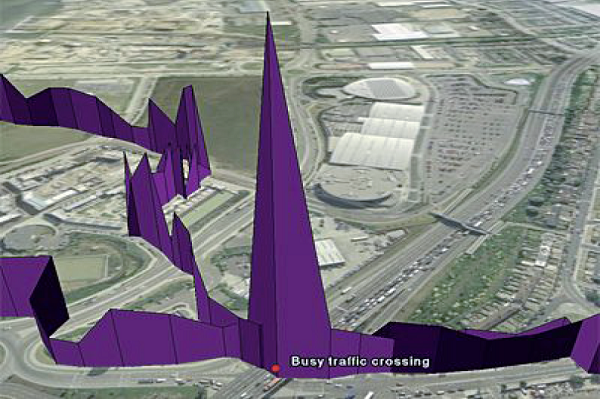 Above is an image from 'Bio Mapping' project of Christian Nold. The picture was taken from a presentation made on Day 3. The following exercise re-divided the participants and asked each group to focus on various combinations of datasets that can provide insight regarding existing conditions, policy implementation status etc., and choose appropriate visualisation type to represent them. The participants worked using both paper prototypes, familiar tools (such as Microsoft Excel) as well as tools introduced in the workshop (such as ManyEyes). All the produced data visualisations were presented by the groups and were discussed in detail, with a strong focus on comprehending the appropriateness of various visualisation types and suitable use of graphical elements (such as avoiding 3D charts), and addressing challenges of complex visualisations (such as those using more than three variables, or variables measured in different units) etc. The very useful visualisation type of Bubble Chart was discussed in depth, including both its static and dynamic versions. The fourth day focused on map-based or geographic visualisations. It began with a brief history of cartography, focusing on its military, administrative and maritime navigational usages. Considering the technical and operational transformation brought to the domain of cartography with the development of Geographic Information Systems, the discussion moved on to talk about the opening up of digital geographic data, its increased availability and easier usage possibilities in the post-Google Maps era. Open licensed crowdsourced spatial data projects like OpenStreetMap and Ushahidi were discussed in detail as potential tools for sourcing, gathering and using geo-data. There was an extended discussion of different free and open source tools for working with spatial data, including Quantum GIS and TileMill. Picture of Open Street Map. This picture was taken from the slide presented on Day 4. The exercise focused on developing scenarios representing open government data using map-based visualisation, so as to gain special insights regarding spatial effects and natures of various social conditions as well as to share government information with non-governmental agencies and individuals. 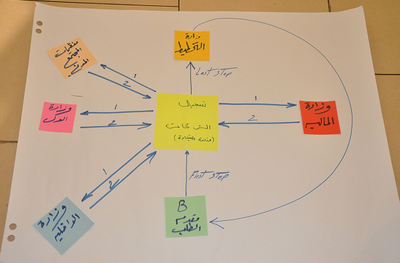 Different groups worked on scenarios such as mapping the incidents of cancer patients and defective births among different governorates, along with locating the spread of radioactive elements across the regions concerned; mapping the number of disabled people, orphans and unemployed persons across the governorates; and locating the major foreign trade hubs of the country and showing the goods being traded through each hub with periodically updated values of each type of traded goods. Both the data visualisation scenario building exercises, using statistical and geographic visualisations, were built on the assumption of intra-governmental sharing of non-sensitive, digital and standardised data, and highlighted the insights that can be gained by multilaterally using data collected by different government bodies. Some visualisations created in the exercises showed how the government can better inform the citizens and the business communities about the status of various economic and administrative processes, while most of the visualisations focused on using data from across government bodies to support and inform design and implementation of governmental activities. On the fifth day we had a visiting expert, Hazem Zureiqat, who spoke extensively on collection, management and use of data in urban planning. Mr. Zureiqat is a transportation consultant at Engicon, a multidisciplinary consulting engineering firm based in Amman. His talk included examples from various transportation infrastructure projects he has been part of. He showcased various sophisticated data gathering and simulating techniques. The fundamental point of his talk, however, was that data collection, visualisation and simulation are only tools for supporting administrative and political decisions, and not their substitute. The early draft of the Iraqi public data policy, as produced in the earlier workshop (held during 12th to 17th October) was presented to the participants of the second workshop, and the linkage between the two workshops – in terms of creating scenarios for supporting the use cases of the data policy. This was followed by an intensve discussion of the way forward, including the possible strategies and learning events that can be adopted and organised by UNDP, Iraq to continue strengthening the e-Iraq initiatives. Click to download Sunil's presentation on Day 1.Slides from different presentations done at the same workshop can be downloaded here. The author, Sumandro Chattapdhyay is a researcher based in Delhi.